What is Discord and How Does it Work? 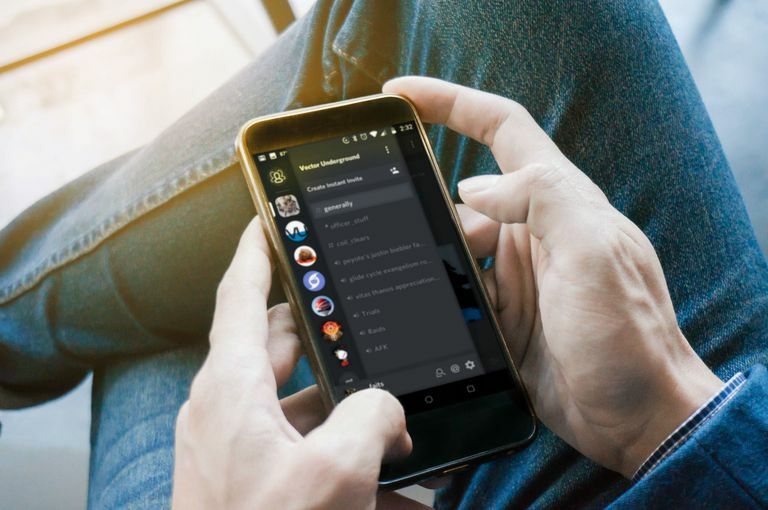 Discord is a free app that combines the voice chat aspects of services like Skype and Teamspeak with the text chat aspects of Internet Relay Chat (IRC) and various instant messaging services. It's available as a standalone desktop or mobile app, but it's also possible to access Discord through a web-based app that runs in web browsers like Chrome and Firefox. Instructions in this article apply to the the Discord app for Windows, MacOS, Linux, Android, iOS, and web browsers. What is Discord Used For? Discord was made for online gamers as a free alternative to voice chat services like TeamSpeak, Mumble, and Ventrilo. These services all exist to facilitate Voice over IP (VoIP) communication between members of gaming clans, guilds, and other groups. Instead of using the voice communication tools built into games, which are often lower quality, lacking in features, or missing altogether, gamers use these services to play together. The downside of most VoIP services is that they require a server, which usually isn't free. Some hosting companies provide a free VoIP server when a regular game server is rented, but there is usually some cost associated with running a TeamSpeak, Mumble, or Ventrilo server. Discord offers a similar service at no cost. The Discord app is free to download, signing up for a Discord account is free, and anyone can create a Discord server for free. Discord offers a premium service called Discord Nitro. Paying for this premium service comes with perks like larger image uploads and the ability to choose the numbers that are otherwise added to your Discord username at random. To get started with Discord, you need to create a temporary account. You can register this account to make it permanent, or discard it when you're done. Navigate to the Discord app website in your browser. Select Open Discord in your browser. Type your desired username and select the arrow in the text field. Your username doesn't need to be unique. It will be combined with a four digit number to differentiate it from other users who use the same name. Check the box beside I am not a robot, and complete the captcha if one is presented. Select Skip to immediately start using Discord, or select Get Started for a tutorial. Enter your email and password, then click Claim Account to register your account, or click outside the pop-up widow to skip this step. Start searching for communities and servers to join. If you don't finalize your account creation, the account will be lost when you close your browser. Select Claim Account, enter your email address, and then follow the instructions in the email to make your account permanent. At this point, if someone gave you an invitation link to a server, you can click on it to join. Discord is available as a web app that runs in most modern browsers, and you can also download a desktop version for Windows, MacOS, Linux, Android, and iOS. The desktop and web versions of Discord are functionally identical in almost every way, and they even look almost exactly the same. That said, there are a few differences between the browser and desktop versions of Discord. In the desktop app, push-to-talk is enabled all the time; in the web app, push-to-talk only works when the browser window is in focus, so it's unavailable while playing. The desktop version also allows you to show your friends what game you're playing. The major benefit of the web version is that it doesn't require a download, so you can use it anywhere, on any computer, without waiting to download and install anything. If you use Discord a lot, the desktop app is a worth download, but the web app is great because it lowers the bar for entry. For instance, say you're playing a game with your friends, and you want to invite an outside player into voice chat. With a service like TeamSpeak or Mumble, they would have to download the app, create an account, and enter your server information. With Discord, all they have to do is click your invite link, type a temporary username if they don't already have one, and they're ready to go. In addition to the desktop and web apps, Discord is also available as an app for both iOS and Android. The Discord mobile app has a very similar look to the desktop app, but it's modified to work on smaller screens. When you're on a server, swipe right to see a list of the voice and text channels, and swipe left to see a list of all the members on the server. Voice chat on the mobile Discord app works just like the desktop app, so you can use it to communicate with your friends or teammates if you're playing on a console that doesn't support Discord. You have all of the same abilities to adjust the volume of other users, mute people so that you can't hear them, and mute yourself if you don't want your friends to hear what's going on in your house. Download Discord for Android from the Google Play Store or Discord for iOS from the App Store. Although Discord features many servers that anyone can join,there's no central list of all servers that you can look through. To join a Discord server, you often need a member or admin of that server to give you a link. Some servers have permanent links, and others expire within a day. Launch the Discord app, or open Discord in your browser. Select the plus (+) on the left side of the window. Enter your invite link, then select Join. To leave a server, right click the server's name in Discord, and then select Leave Server. If you have a friend with a Discord server that you want to join, ask for an invite. If you're a member of a community that uses Discord, you can ask for an invite, or look on the community website, subreddit, forum, wiki, or wherever else you think a permanent link might be stored. You can also search for public servers that anyone can join by selecting the magnifying glass on the left side of the Discord app interface. Enter a server name and select a region. Your server will be ready to go immediately, and you'll be given a link to share with others. Make sure to check the box where it says Set this link to never expire if you want to create a permanent link for your community. Select Invite People from the server page to see the invitation link again. Invite friends and people from other servers by right clicking their user icon in Discord and selecting Invite to server > Your server. Select your server from the list on the left side on the app window. Select the down arrow next to your server name. Select Server Settings from the drop-down menu. Reenter the server name when prompted. Select Delete Server to confirm. You cannot undo a server deletion. Before taking down your Discord server, make absolutely certain that you really want to delete it. There is no way to search for friends by email addresses or usernames, so you will need to either have someone's full discord tag or be friends with them on another platform before you can add them on Discord. Look in the bottom-left corner of your Discord home screen to find your full Discord tag under your username. Select the Home icon in the upper-left corner. Select Add Friend and enter your friend's full Discord tag, then select Send Friend Request. Your friend will appear in the Pending tab until they accept the request. The desktop version of Discord also allows you to link your Discord account with other services like Battle.net, Steam, and Reddit. You don't have to link accounts, but doing so makes it easier to find your friends. Linking some accounts, like Xbox One, also enables the ability for your friends to see what you're playing on the other platform. To link accounts on Discord, select Connect Accounts at the bottom of the Add Friend screen. This gives you the option to select the type of account you want to connect. You can also choose which connected accounts you want to display on your Discord profile. When you link your accounts, Discord will automatically pull your friends list from the other service and check to see if any of your friends are on Discord. If it finds anyone, you will have the option to send a friend request. In addition to servers, Discord also supports direct messages (DMs) to communicate privately with friends as well as group direct messages to communicate with small groups of friends. These exist separately from servers, so you and your friends don't need to be members of the same server to use this feature. Select the New Group DM icon in the upper-right corner of the app. Choose friends to invite, then select Create Group DM. Select the phone icon to start a voice call, or select the video camera icon to start a video call. With a voice or video call in progress, select the camera icon to turn on your webcam, or select the monitor icon to share your screen. Select Leave Call to end the call when you are done. Up to 10 people can participate in a Discord group DM at once, so it's a good way for small groups to communicate without the need to create a separate server. If you want to have more than 10 people in a call at one time, you will need to create a voice channel on a Discord server and use that instead.